Our history with the Upper Valley community was started in Troy, Ohio in 1981 by Craig Critchley, DO and Richard Plumb, DO. As the practice grew, additional physicians, staff and facilities were added. James Burkhardt, DO. joined the practice in 1986; James McNerney, DO joined in 1996; Kendall Erdahl, MD joined in 2007. In addition to our physicians, we have expanded our team to include of advanced practice providers (APPs) which includes our certified nurse practitioners and physician assistants. Our office in Piqua, Ohio was added in 1986. We are proud that both offices are NCQA Patient Centered Medical Home Level III Recognition (2013 and again in 2016). In 2014 our practice was named a 2014 Million Hearts Hypertension Control Champion by the Centers for Disease Control. In 2017, we joined Kettering Physician Network and have a staff of more than 50 employees, each serving an important facet of patient care. It is our committment to provide exceptional medical care for you and your family, and that dedication takes more than just the doctor, we are team. We have a staff of dedicated, caring employees working together to serve you. Our team includes: Advanced Practice Providers (APPs) like certified nurse practitioners and physical assistants, as well as nurses, medical assistants, laboratory technicians, receptionists, schedulers and more, who all have their areas of expertise. Many of our team members have more than 10 or 20 years experience at our practice. Both offices have successfully attained Level III NCQA Patient Centered Medical Home recognition. Everyone needs to be heard. We know that. 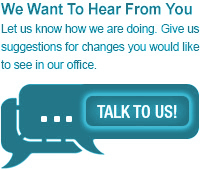 We invite you to express your concerns, ask questions, and really let the doctor know what is on your mind. This allows us to do a better job. Medical science is often difficult to understand and the health care system can be confusing. We are able to interpret information in ways that make it understandable. We meet the challenge of translating medical jargon into information you can really use. Our team of nurse practitioners and physician assistant are available for patient education and life style modification training for medical conditions such as asthma, cholesterol, diabetes, osteoporosis, and smoking addiction. Our in-house COLA certified laboratory offers most standardized laboratory tests and offers the convenience of in-office blood draws. In addition to EKG’s normally done in the office, echocardiograms and other cardiac testing can also be done right in our offices. Echocardiograms are done by highly trained and certified sonographers and read by Board Certified Cardiologists. IV fluid replacement can be done in the office. Organic chemicals are used to bond with heavy metals in the bloodstream and tissues to remove heavy metals from the body. Testing done to determine lung capacity and how well the lungs move oxygen. Treatment of hormone imbalances with bioequivalent topical hormones. Supplements-Medications and life style habits can interfere with the body’s natural functioning. Available testing can assist in determining where your system may be out of balance helping the physician recommend natural ways to restore balance. Vitamins and supplements are not a guarantee for a cure, recovery, or increased longevity and do not take the place of traditional medical care but can be a supplement to traditional medicine. Our Availability- As a family medicine practice with two locations, and part of a renowned health system, Kettering Health Network, we can almost always provide appointments within 24 to 48 hours for established patients with acute problems. We try to keep you with the same provider and location but there may be times that we will request that you see another provider or go to the other office. Saturday hours at the Troy office are available for all patients with injuries and acute problems such as allergies, sore throat, and influenza. There is no one in a better position to guide you through the maze of “Preventive Health Care” than our staff. We can help you implement preventive strategies that are uniquely appropriate for you through our Focused on You program. Our Medical Staff includes DOs, MDs, Nurse Practitioners and Physician Assistants. We believe the breadth of training and expertise of these medical disciplines enhances our ability to provide outstanding medical care. We use advanced technology to simplify time consuming, personnel intensive tasks giving us more personal time with you. In use since 2005 assists the doctors in trending data, provides visit summaries, and Focused on You reports with each visit. Our Kettering Physician Network patient portal, MyChart, is provides secure email for simple patient questions, test results, appointment requests and more. Our Focused on You program uses the information obtained from you and entered in your health record to determine if you meet nationally recognized health care goals or what needs to be done to get you there. A personal assessment considering your gender, age, and other key variables, run with each office visit, compares your current health status to the latest guidelines. Suggestions can then be made on ways to get you to goal. E-prescriptions are computer-generated prescriptions sent directly to your pharmacy. Refill requests are sent to us from your pharmacy through the same network. Automated appointment reminder phone calls are made 2 days in advance of appointments between 6:30 and 8:30 pm. If you will be unable to keep your appointment, this system allows you to leave a message. Insurance can be confusing. Our specially trained team is available to help you with financial or insurance questions.